Howdy everyone and I hope all is well today!….I’m watching one of my favorite movies; the Bird Cage and staring at my fabric; just letting my mind wander….Things going on today have gone on before and reflections on those times are inevitable I suppose….Sewing keeps me from being so angry about the things I’ve learned and the things I currently see and for that I am eternally grateful….this post is about honoring Ms. Coretta Scott-King and my ancestors as well….Let the rambling begin yeah? If you’ve been following my modest blog and social media accounts then you know all about my absolute love for anything vintage…if you’re new here you’ll catch on pretty quick….I also aimed to feature Black women this month; something to say THANK YOU for them risking everything and just giving a damn in general when so many just “look the other way”…..Now let’s get some facts going here as reminders of how Black women pave the way for well damn near everything!…Shall we? Why yes, yes we shall…. Ms. Coretta Scott-King ‘s birthday is April 27, 1927….She was considered a peace advocate and the 1st Lady of the Civil Rights Movement….You could always find her right by her husband’s side (Dr. Martin Luther King Jr.) fighting for justice for US, ALL OF US….I learned that she was musical as a child; taking voice lessons and learning to play the violin….Ms. Coretta Scott-King was very passionate about social injustice and fought for an equal nation here AND overseas….she wanted peace and love everywhere, not just in the United States….She knew social injustices didn’t just happen here…..Even after her husband was murdered she kept fighting…..She campaigned to make her husband’s birthday a national holiday with the first observance in 1983…..I don’t know about yall but I’m forever in this woman’s debt and this post is the least I can do….Thank you Ms. Coretta Scott-King for being fearless in the face and hate and evil….something I don’t know if I could’ve done….THANK YOU, THANK YOU, THANK YOU….. 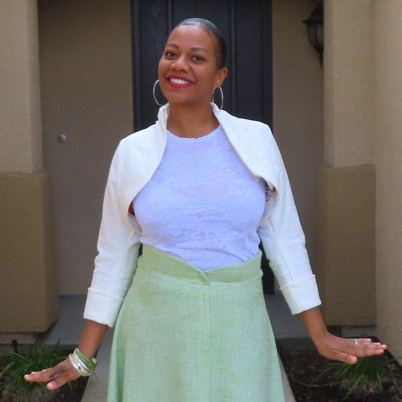 The outfit featured is from her era of fashion so when the idea of featuring Ms. Scott-King I wanted to whip these two pieces up….I made Simplicity 8250 which is a skirt and bolero combo…..when I was researching her I noticed she wore a lot of longer skirts and boleros….I love that combo too!…. Now on to the fabrics and patterns….I used two Simplicity patterns; Simplicity 8250 and Simplicity 9069….the bolero and skirt are a reprint from the 1950s pattern which is right up my alley….the t-shirt pattern is from the 70s….the 1950’s pattern kinda irked me because of the instructions again being unnecessarily difficult; and with it being a remake I’m thinking the instructions were changed which resulted in them being quite annoying to say the least…..the 70s pattern came together in about 45 minutes yesterday for today’s photos after I discovered I had no top to wear!….the skirt was whipped up using a boucle’ I had in my stash and the bolero from an off-White denim; also from my stash….the t-shirt was whipped up using a laser cut White knit fabric; I had a little piece left and it worked perfectly…..the pattern called for an invisible zipper but I wanted an exposed zipper and it kicked the skirt up from “that’s nice!” to “HELL YEAHHHHHH”! soon as I added it…..I’m trying to force Spring with this outfit I’m telling yall! This post is quite long so I’ll hush; the others this month may appear that way too because I wanna do little history lessons along with my sewing shenanigans so bare with me….Now pictures and yall have a good weekend! Check the Simplicity vintage umbrella!….allat’ yall, allat’…..
Up close, my purty vintage prop….we are expecting rain today soooooo…..